The cities of travel are often passed with no thought to what they are. Many, many, many years ago, I lived in Bloomington, Indiana, an hour's drive south of Indianapolis. 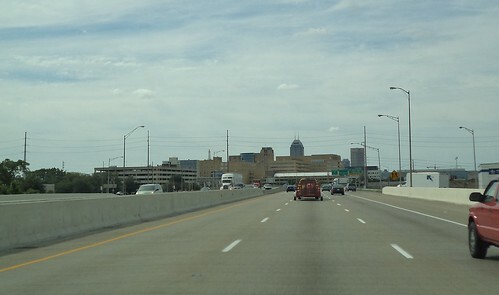 Passing by Indy on my way east, I thought of how different it looked those decades ago. It was quite derelict back then. 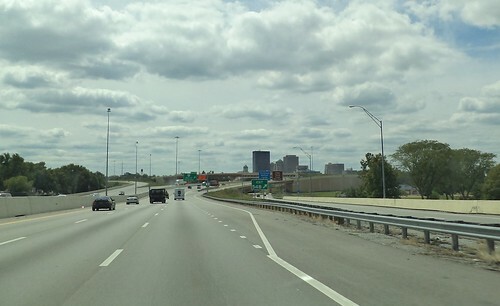 In the 1990's, the skyline was dominated by the RCA Dome, a white concave structure you saw on the left side of this photo. That's been replaced, but you can't see the new stadium from I-65. Indy comes across a very utilitarian city. Form follows function with a parking garage and the squared, boxy buildings of a medical center complex. 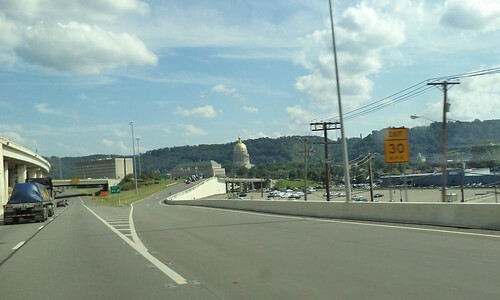 There's a capital building in the center of the city, but I couldn't see it from the road. And then there is Dayton, Ohio. I can't remember if I've been by Dayton or not. I think not. The downtown was less horizontal than Indianapolis, more vertical. Indy was tan. Dayton was steel and black and blue. My preference is not to drive through a metropolitan area while traveling. I guess that comes from living in Chicagoland and knowing the phrase, "You can't get there from here" very often pertains to traffic in Chicago. But this journey east took me, following the map, unavoidably, past the centers of cities. I love living in Chicago, love looking at the city's profile. I'm so used to the buildings with 50+ stories that buildings with 20 stories being the tallest give me pause while realizing that, to the residents of this city, this is tall. 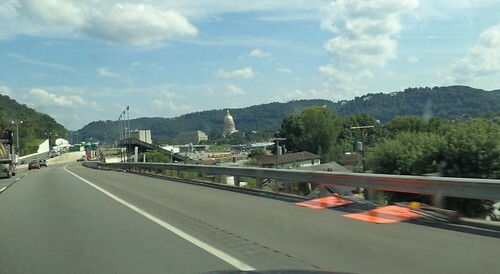 Many years ago, on a family trip out east, we drove by Charleston, West Virginia. I knew, given the lay of the land, that the Interstate had to be placed in such a manner that you drove right by the capital building. At that time, I thought it would be neat to make a pilgrimage to the various capital buildings of all 50 states, take their tours and look at their construction. As I drove by this, I was kind of sad that I let that idea die. I don't believe in "bucket lists". (That's a post for another time.) I simply enjoyed the view of the capital building of West Virginia gently reflecting the sunshine of an August afternoon.